AMD has just revealed quite a lot of news concerning its new and upcoming CPUs, which will find themselves employed in products as diverse as servers, creator workstations, gaming desktops, and svelte 2-in-1s over coming months. Today it gave a launch date for its EPYC processors for servers, previously codenamed Naples. We learnt more about Threadripper HEDT and its launch schedule. Last but not least we heard about Ryzen Mobile APUs which will bring 4C/8T Zen processing, plus Vega graphics processing to sub-15mm laptops and convertibles. The first EPYC processors will launch on 20th June. AMD expects to launch with widespread support from original equipment manufacturers (OEMs) and channel partners. EPYC will provide a compelling new choice for servers and data centre machines with more of all the essentials: more cores, more memory bandwidth, more I/O. It delivers "tremendous performance benefits" compared to Intel based alternatives in tasks such as memory bound workloads and virtualised compute workloads. The EPYC processors are "optimised for today's workloads," asserted Dr SU, by AMD thinking about how a server or data centre works, not solely concentrating on CPU performance. Importantly AMD's designs offer better efficiency too with up to a 30 per cent TCO advantage, claims the company. Aiming to revitalise the HEDT segment later this summer, Threadripper processors offer up to 16C/32T of CPU processing power. 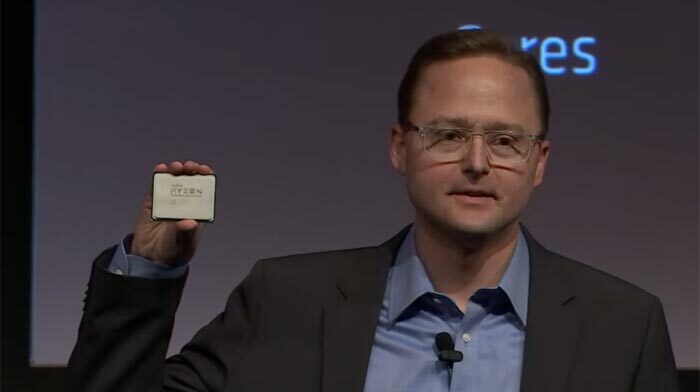 We previously saw the first official info about this processor line at the AMD financial analyst day. New for Computex is the fact that AMD has announced cutting-edge high-performance motherboard designs from ASRock, Asus, Gigabyte and MSI, built upon the X399 chipset. These motherboards help propel Threadripper performance with features such as quad channel memory with support up to 2TB of RAM, 64 PCIe 3.0 lanes, and superior I/O options. The first Threadripper processors and partner motherboards will become available later this summer. AMD says that it has already been working for a number of months with partners on Ryzen Mobile systems. These products are scheduled for release in H2 2017. Systems will be targeted at a wide variety of specialised use-cases such as 2-in-1s, thin and light, thin and light gaming. Commercial productivity laptops based upon Ryzen Mobile are due early next year. The graph below sums up the appeal of Ryzen Mobile; boasting significant uplifts in CPU and GPU performance, with superior power efficiency. These are delivered by the combo of Zen and Vega technologies. AMD said that the charted performance uplifts are delivered with 50 per cent power consumption - it's not a tricky either/or choice for OEMS. A sub-15mm reference design Ryzen Mobile 2-in-1 was demonstrated on stage (video 37mins onwards). 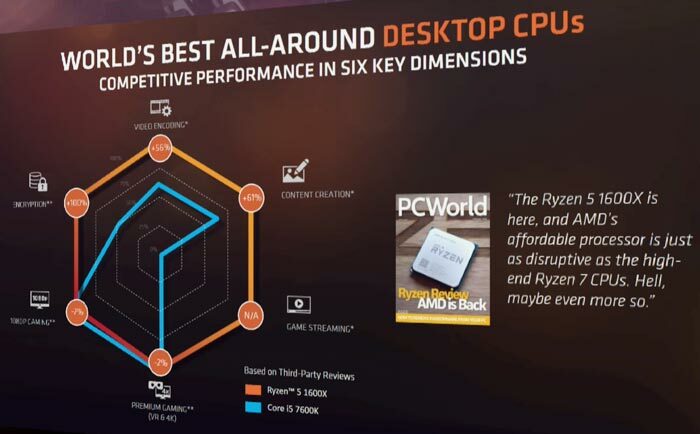 Later AMD went on to remind us of the value and processing power appeal of the Ryzen desktop processors it has already launched so far this year. A good example is shown below, with a Spider Graph comparing the AMD Ryzen 5 1600X against an Intel Core i5-7600K. For your convenience I've embedded the full AMD Computex presentation again below. What are you retarded? Can't read a graph? AMD have never, to my knowledge, claimed that Ryzen is faster than Kaby Lake in gaming. They've not made a big deal of the fact, but then you wouldn't expect them to. They've emphasised instead how close to parity they are when the resolution and IQ are turned up (in other words, when the GPU is the limiting factor). That's pretty much a direct personal attack. Knock it off if you want to keep using these forums. If you have a point to make do it without using offensive language and without attacking other members. To be honest, it sounds more like a badly named gaming brand rather than a good name for server CPUs. I think they should have just continued to call it Naples.